Follow manufacturers’ recommended doses for your water type when using household cleaning products. Soft water requires far less detergent concentration than hard water. Try to use cleaning products little and often so your treatment plant is not overloaded. Use liquids (not powders) in washing machines and dishwashers. Powders re-coagulate into clumps and can cause blockages. Try to spread your clothes washing throughout the week. Stick to the same washing, dishwasher and other cleaning products as the bacteria will work more efficiently with products it is used to treating. Think before you put anything down the sink, toilet or drains. Desludge your plant when required. Click HERE to view our one-page KEE EXPERT guide on proficient desludging and how regularly your unit should be desludged. Ensure only toilet paper is flushed down the toilet and used in normal quantities. Leave your plant switched on while you are away or on holiday. Switching off your plant can cause damage to the motor and moving parts as well as kill the biomass. Compost all your organic food waste or use your local council bio–degradable waste recycling service (where applicable) to dispose of organic waste. Do not flush organic waste down the sink or drain. Don’t put sanitary towels, tampons, cotton wool or cotton wool buds, incontinence pads or any baby, cleaning or facial wipes down the toilet. Don’t flush rubber products or other non-biodegradable products down the toilet. Don’t pour fat, grease or cooking oil down the sink or drains. Fats suffocate the bacteria and inhibit the biological process. Everyday products such as milk, wine or beer increase the organic load and should also not be disposed of through the wastewater system. Don’t use neat disinfectant or bleach. KEE recommends that these products are only used at the minimum concentration possible, as they can restrict the biomass growth within the plant. Don’t tip medicine, mouth wash or any chemicals such as photographic fluid or garden products (e.g. Insecticides, weed killers and fungicides) down the drains as they will damage the biological treatment process. Don’t pour DIY products (e.g. paint, thinners, turpentine and white spirit etc.) or car fluids such as engine oil, anti-freeze, brake fluid etc. down the drains. Don’t allow rainwater, groundwater or large volumes of water (such as those from a swimming pool or Jacuzzi) into the plant. Chlorine kills the bacteria and the excessive water will increase the flow rate through the plant, not allowing sufficient treatment time. Don’t fit a waste disposal unit under your kitchen sink. Disposing of organic matter through the treatment system increases the organic load, creating bacterial overgrowth which will inhibit the treatment process. Only use a waste disposal unit if your plant is specifically designed to accept higher organic loads. For more information or to arrange a tankering visit, please call our KEE Services team on 01296 634500 or visit our KEE Services website. This entry was posted in Desludging and Jetting Services, Wastewater Plant Operation, Wastewater Treatment Plant Refurbishment, Wastewater Treatment Plant Servicing and Maintenance and tagged Package Pumping Station, pump equipment repairs, pumping equipment maintenance, septic tank repairs, sewage plant servicing, sewage treatment repairs, Water Pumps Repairs on December 21, 2017 by Connellmarketing1234. KEE News – It’s all change in 2020! 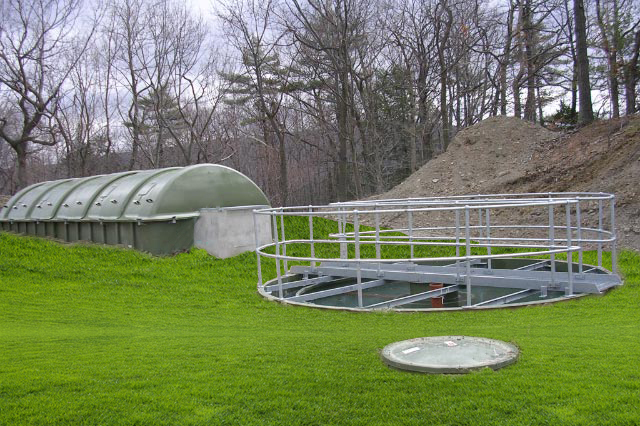 What do the latest septic tank regulations mean for you? “Septic tank regulations” – I agree it’s not an opening phrase that would make many people read on, but if you have a septic tank on your property, then you might just need to read on. Given what goes into a septic tank, it’s understandable why the Environment Agency is keen to make sure that it stays in the tank, instead of in the local stream. So, there are a lot of rules and regulations surrounding septic tanks, from where you can put them to where and how the water can be discharged. The latest regulations came out in 2015, and are called `General binding rules: small sewage discharge to surface water’. It doesn’t exactly trip off the tongue, but it’s a very important document for many property owners and worth a read. To a drainage field or soakaway system – here, the waste water percolates through holes or slots from the pipework, into a soak away (pit filled with rubble or course stones) and then discharged into the surrounding sub-soils. To a watercourse – the waste water would flow through a sealed pipe straight to a local watercourse such as a stream or a river. From the 1st of January 2020, you will not be able to discharge your wastewater into a watercourse. The reason for this is because the `quality’ of the waste water is no longer considered clean enough for our wildlife or rivers. This isn’t an entirely a new rule as for some years now, property owners installing a new septic tanks have not been able to discharge into a watercourse. However, if your property had an existing septic tank discharging into a watercourse, you were able to carry on unless the Environmental Agency identified that it was causing contamination. So, if you are looking to sell your property between now and 2020 you will be required to ensure your Septic Tank meets the new regulations before you sell. Install a sewage treatment plant – Sewage treatment plants clean and filter the wastewater to remove harmful toxins and impurities, making the wastewater clean enough to discharge straight into a watercourse. Install a drainage field or soakaway – This will take the waste water from your septic tank, and disperse it safely into the ground without causing pollution. However, space is required as a soakaway must be located at least 5 meters away from any property and at least 6 meters away from a Public Highway. To conclude, if you do not have the space to install a soakaway on your land and are not close enough to a mains sewage system to get connected then a Sewage Treatment Plant is your best option. For more guidance or a quote, please contact KEE on 01296 634 500 or email sales@keeservices.com. This entry was posted in Desludging and Jetting Services, Wastewater Treatment Plant Refurbishment, Wastewater Treatment Plant Servicing and Maintenance, Wastewater Treatment Process Technologies and tagged septic tank repairs, sewage treatment plant maintenance, sewage treatment repairs, Tankering on November 30, 2017 by Connellmarketing1234. 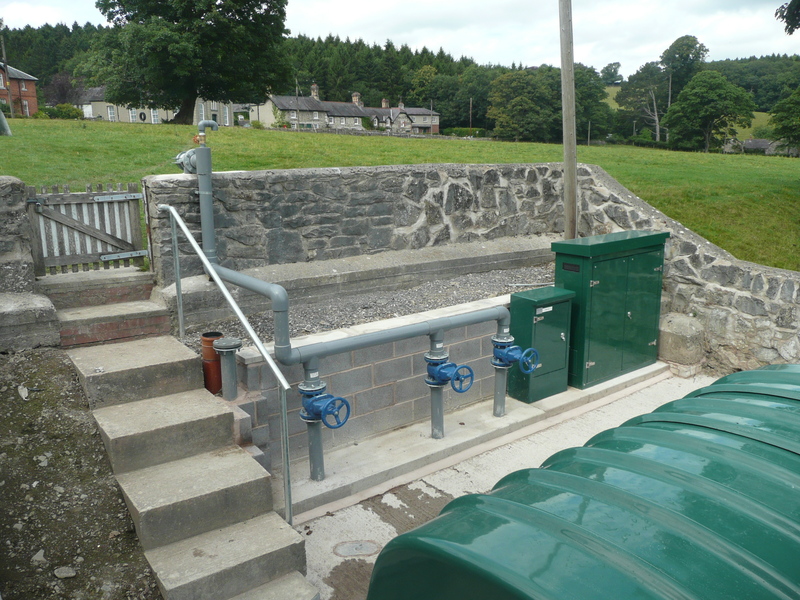 KEE were commissioned to design, build, supply and carry out all civil work, to refurbish and update a very old unit which was unreliable and not performing in a very small Welsh Village. Within the brief, KEE had to strip all the internals and fit a new unit into the existing steel tank on site, as there was no room for digging a bigger excavation. Before – Existing non performing unit in need of complete refurbishment. After: New refurbished RBC unit designed, manufactured, supplied and installed by KEE. For more information on KEE Refurbishment and Updates or details on any other KEE wastewater treatment equipment and systems, please refer to our website at keegroup.com or call us on 01296 634500. This entry was posted in KEE NuDisc Technology, Wastewater Plant Operation, Wastewater Treatment Plant Refurbishment, Wastewater Treatment Plant Servicing and Maintenance, Wastewater Treatment Process Technologies and tagged pumping equipment maintenance, Rotating Biological Contactor (RBC), wastewater treatment equipment refurbishment on October 31, 2017 by Connellmarketing1234. 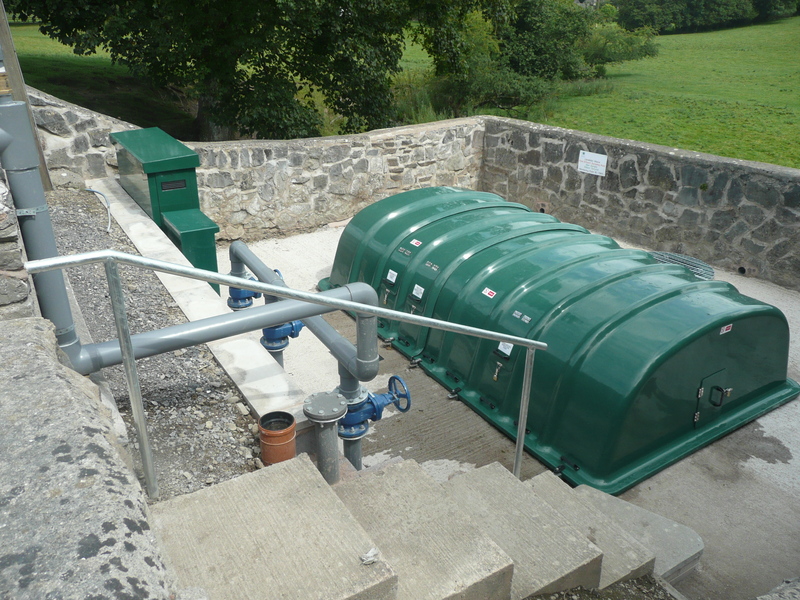 KEE Triton® – Mountmellick Wastewater Treatment Plant Upgrade – The installation of new aeration and mixing units to reduce the carbon footprint and improve plant performance. 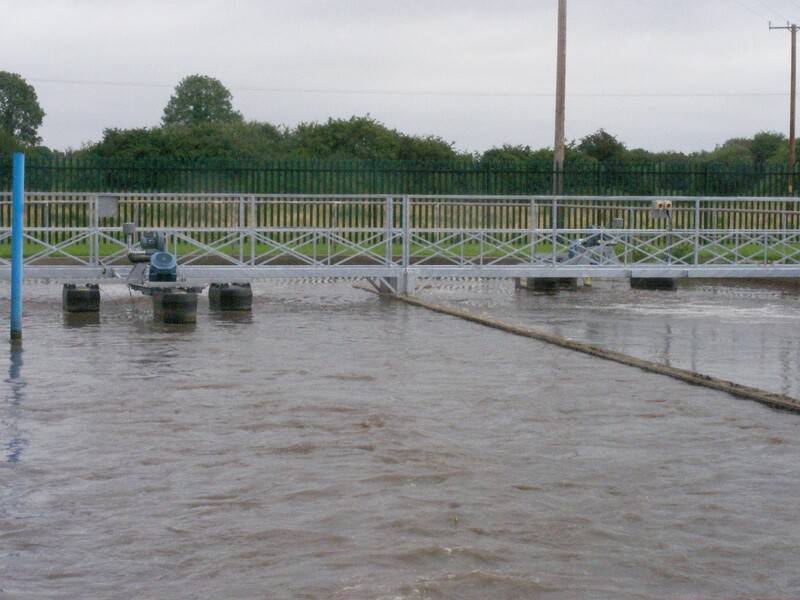 3.7kW Tritons® fixed on a tri-pontoon float. The Triton® can be bridge or side-wall mounted. Mountmellick village is located approximately 15 miles northwest of Portlaoise, County Laoise, Republic of Ireland. As with all Irish towns, Mountmellick has grown greatly over the years. The existing plant was designed and installed in the mid 1970s, with further works being added later, the last being a sludge dewatering plant. An Oxidation Ditch for biological treatment. A 60m long ‘Race Track’ shaped ditch, each lane measuring 7m wide. The total average depth of the ditch was 1.57m with a total volume of 1,340m³. Two final settlement tanks and sludge dewatering works. An ‘activated sludge process’for the biological treatment stage. The design capacity of the works was 5,000PE and the discharge consent was 20mg/l BOD (Biological Oxygen Demand) and 30mg/l SS (Suspended Solids). The brush rotor aeration capacity had proved inadequate and was supplemented by Venturi Aerators. The combined horizontal brush and Venturi Aeration systems were unable to support the process oxygen demand and could not provide the necessary velocity profile in the ditch to ensure the minimum vital mixing requirement of the ditch contents. Consequently, the plant was failing consent. In addition to the problems associated with the failure of consent, the high power demand to run the aeration system at Mountmellick (i.e. two 7.5kW drives for each horizontal brush rotors and two 13.50kW drives for each Venturi Aerator) also made it expensive to run at existing capacity. However, the need to increase plant capacity from 5000PE to 7000PE meant that the high power supply to the existing plant provided an opportunity to review the whole process performance of the aeration system and deliver a solution to reduce carbon footprint. KEE Process was contacted by Laois County Council, to discuss how the Triton® aerators and mixers, could overcome the current process load issue facing the Mountmelick plant and explore the option to save power and increase the plant capacity. After discussions with Laois County Council and their consultants at Nicholas O’Dwyers, KEE visited the site to review the existing plant design and formulate a proposal. After further liaison and evaluation of the actual dissolved oxygen requirements, it was agreed that the plant upgrade should be carried out in two phases using the KEE Process Triton® dual mode, fine bubble aerator/mixer. Phase 1 upgrade – To address the urgent need to increase the process performance of the plant to meet the required environmental discharge consent and also reduce the overall carbon footprint. Phase 2 – To increase the capability to upgrade the plant capacity upgrade from 5000PE to 7000PE and reduce maintenance requirements. Based on the current load and the 20mg/l Biological Oxygen Demand consent for Phase 1, it was necessary to install four 3.7kW Tritons® to provide the supplemental Dissolved Oxygen and all the mixing for the oxidation ditch. These four Tritons® would provide complete mixing of the ditch and generate the optimum horizontal velocity of 0.3m/s to ensure that the suspended solids in the mixed liquor remained in suspension at all times. Although the stated environmental objectives did not require nitrification, we knew that the NH4-N in the influent would exert an oxygen demand due to the high retention time of 20 hours (at DWF) in the oxidation ditch. The projected AOR (actual oxygen requirement) of 959kg/day accounts for both carbonaceous BOD reduction and Nitrification. For carbonaceous BOD removal only, the AOR would be 773kg/day. [Note: AOR is the oxygen required under field conditions of temperature, elevation, desired dissolved oxygen operating concentration]. To provide the projected AOR, eight 3.7kW Tritons® were required, in addition to the existing horizontal brush rotors which would need to be retained. This process upgrade assumed that nitrification would be accepted as a future treatment objective. If this had not been the case then the Tritons on their own would have beeen sufficient to provide all the projected Dissolved Oxhgen (DO) and mixing for the 7000PE capacity. Of all the aeration equipment on the market, Triton® aeration units are the easiest to install. There was no need to decommission the existing plant while installation was being carried out. The Tritons® fine bubble aerators were surface mounted and therefore neither the aeration tank or the oxidation ditch needed decommissioning, emptied, refurbished, refilled and re-commissioned. Tritons® can be bridge-mounted, wall-mounted, float-mounted or guiderail-mounted for SBR configuration. Timing was of the essence to ensure that the treatment objectives were met and therefore the equipment was ordered whilst the installation format was being finalized. 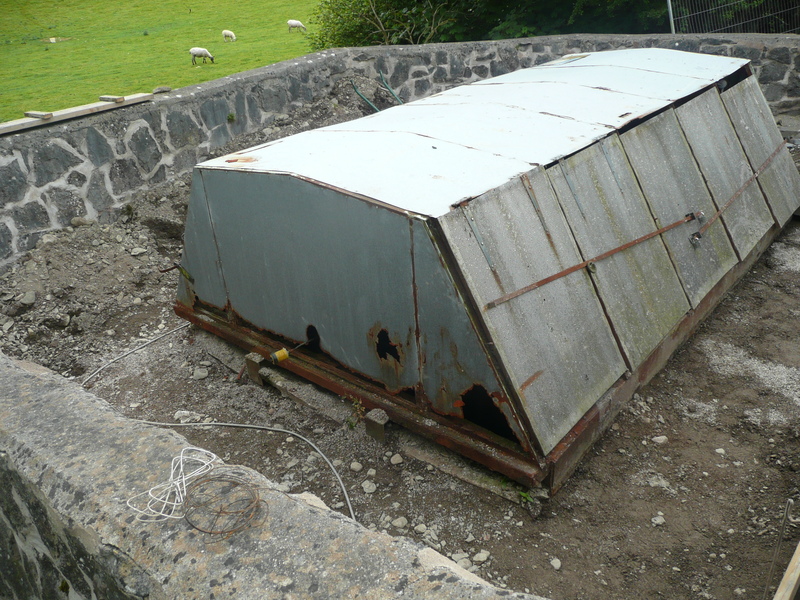 At the Mountmellick site Laois County Council and Nicholas O’Dwyer used a novel adaptation to use a ‘float-mount’ option where the floats were anchored to a steel bridge across the ditch with ‘H Frames’ attached to the bridge. This gave the operators the option to have fluctuating water levels as the H frame pivoted the Triton® floats to the bridge. The existing DO probes were used to control the brush aerators through the variable speed drives and, if the DO remained high, the Triton® blowers could be similarly controlled through the DO probes. At least four Tritons® had to be operating in the mixing mode to completely mix the ditch contents and therefore for Phase 1, the control philosophy was designed only to control the Triton® blowers operation to maintain the DO at between 1 and 2 mg/l. After the Phase 1 installation was completed and within 20 minutes of the four Tritons® being commissioned, the mixed liquor DO concentration started to rise and it was evident that the units were re-suspending solids that had been settled out in the bottom of the ditch previously. Within two days of commissioning, the four Tritons® units were achieving 1-2mg/l DO constantly, with the existing brush rotors only coming on to assist at times of heavy load when the DO concentration started to drop. Four out of the eight Tritons® for Phase 2 were operated in aeration and mixing mode at all times and the other four Tritons® were installed to operate in mixing and/or aeration mode when required. To ensure an even use, it was also decided that the Triton® operation would be alternated in ‘duty’ and ‘assist’ mode. For Phase 1 the installed power was reduced from 42kW to 30kW and the treatment objectives were all achieved. Furthermore, the energy efficiency gains and optimisation objectives were achieved by controlling the aeration mode to provide oxygen as and when required whilst the mixing mode was always maintained to ensure the process performance. Thus, an energy saving over 28.5% was achieved and at the same time the environmental objective for effluent quality was met. Phase 2 was designed to deliver the energy efficiency gains and carbon footprint objectives. The 45kW total installed power for Phase 2 provided a 40% increase in plant capacity whist requiring only a 3kW increase in power. The carbon footprint can be further reduced if, as required by the consent for discharge, nitrification of the effluent was not pursued. For more information on KEE Tritons® or any other wastewater treatment equipment and systems, please refer to our website at keegroup.com or call us on 01296 634500. 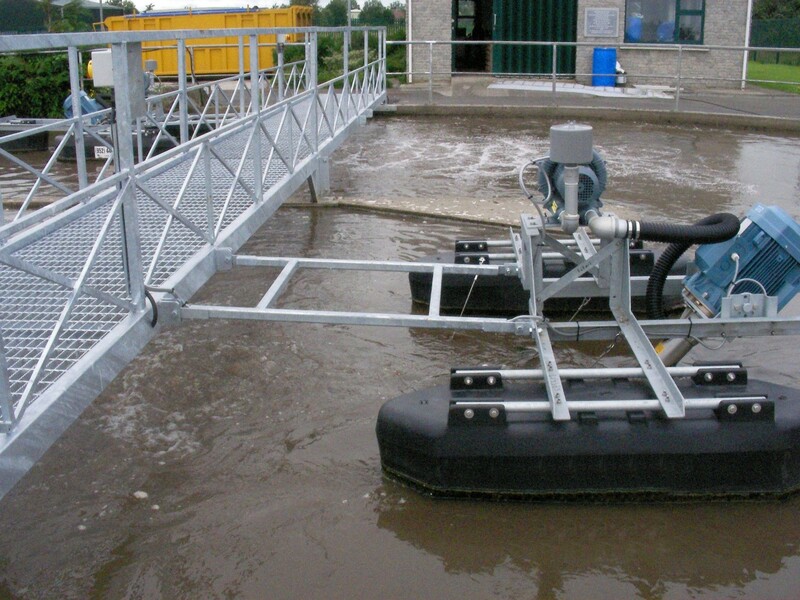 3.7kW Tritons® on a tri-pontoon float in position and fastened to the access gantry. The Triton® can be bridge or side-wall mounted. This entry was posted in KEE Aeration Systems, Wastewater Treatment Plant Refurbishment, Wastewater Treatment Plant Servicing and Maintenance and tagged aerator mixer, oxidation ditch, sewage plant service, sewage treatment plants on September 26, 2017 by Connellmarketing1234.